BRING NAT HOME IN 2010!!! naturallynat.net > NaturallyNat > News & Notices (Moderator: Admin) > BRING NAT HOME IN 2010!!! Get your hands on THE calendar of the year! 12 exclusive gorgeous pictures of Nat to keep you company through 2010! Start the year with the right foot forward in January! Mug for the exams in March with Nat! 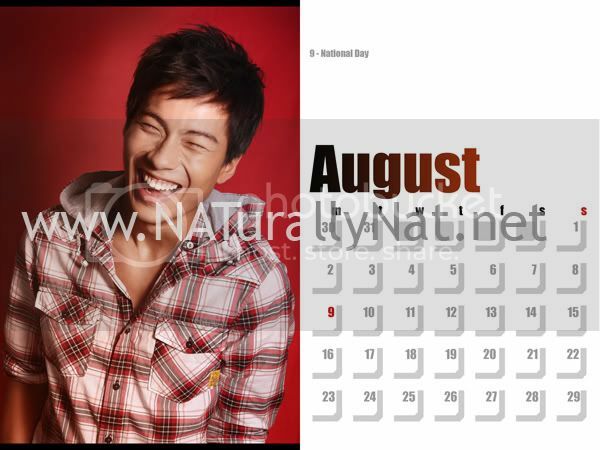 Share Nat's mirth in August! Each and every photo was conceptualised and designed by Nat himself, for us, his fans! The effort and time Nat specially spent on the photoshoots amidst his packed schedule... all the painstaking hard work and attention to detail... the genuine care and attention he pays his fans... the 200% he puts into everything he does... just makes everything we do for him pale in comparison! Good things should be shared... so the NATurally Nat Family is thrilled and proud to offer all fans of Nat a "piece" of his love and talent and hearfelt appreciation towards all his supporters! Don't envy us! Come! Read on for details on how you can bring Nat home for 2010 too! Re: BRING NAT HOME IN 2010!!! This exclusive 2010 calendar can be yours for only $15! Upon receipt of your email, we will email the a/c number for you to transfer the money. Your order will only be confirmed when payment has been received. Once we received your email and payment, your Collector's item will be on its way to you. Yes it is my favourite calendar for 2010..
it is a calendar that makes one smile ..
Gordon.. regarding postage to China, it can be done.. just pm me..
TH CALENDER THAT CAN MAKE ALL OF US SMILEEEEEEEEEEE ! i failed to buy one. this came just in time! hehe, first gift of 2010, I bought the calendar from Singapore under Karen's help. Now I am waiting for the calendar in Shanghai. Thank you once again for being Nat's 1st OVERSEAS fan!! Hmm.. I should add a new sub-title "BRING NAT TO CHINA IN 2010"
It is very happy to be Nat's fans and also to be your friend. Nat is welcomed to China. Hope it can become true in 2010. I just walked over to my study table and flipped the page..